It’s spring, which means stir-crazy recreationists are heading into the woods and hills. Whether you’re looking for wildflowers, hunting turkeys or hiking mountains in Northeast Washington and North Idaho, that means you’re in cougar country. As always, bear spray isn’t just for bears. Don’t leave home without it. Do not turn your back on the cougar, crouch down or try to hide. Face the mountain lion and slowly back away. Leave the animal an escape route. Try to appear as large as possible. Stand on a rock or stump, hold up your arms, stand next to others. Shout, wave your arms and throw objects if the lion does not leave the area. Fight back if a mountain lion attacks. Stay on your feet and use sticks, rocks, backpack or hands to fight back. Use bear spray if you have it. A couple of hours earlier, I stood with other runners in the Incline Club, whose motto, “Go out hard. When it hurts, speed up,” I usually don’t live up to it, but that’s not the point. At 8 a.m., in 10 degrees, we set out in hats and gloves and running tights, carrying hydration packs with drinking tube that will freeze unless you mix in Gatorade. If it’s cold enough, the tube will freeze even if you tuck it inside your wool shirt next to your skin. This is all part of pushing yourself in a wild and untamed place that’s a world away from offices and obligations. “Are you OK?” a passing runner asks, stopping to help me. “I think so, but my ribs hurt,” I say. “They hurt bad.” We have 5 miles to go, and despite the heat, this runner helps me get back to the trailhead. Whether it’s broken ribs or one of those races in which the heat and altitude land me in the medical tent on oxygen or an IV with two bags of saline, a hug and a high-five remind me it was “just a bad day” in trail-runner speak. I ended up on my own on that February run. I had the trail to myself as I turned around at a popular stop, No Name Creek, about 4 miles up. As I’ve aged, I’ve felt fear creep into my solo runs. For years, I felt invincible. Despite bear or mountain lion sightings, unpredictable and severe afternoon lightning storms, or not-quite-healed injuries, I would get out on the trail. Now when I run alone, I’m more aware of the sounds around me. A mile or so down that day, the silence was broken by birds fluttering through leaves in the thicket of trees to my left. Then I heard branches crunching. I caught my breath, looked over and kept going. I was spooked, yet grateful that two bad falls on the trail when I was zoning out to music had finally convinced me to give up ear buds. I could always hear what was around me – even if it left me wondering what it was. I had been surprised by the gentleness of deer delicately crossing or furiously running along the trail in front of me. I had seen a few giant bighorn sheep thrust their otherworldly curly horned heads through the brush. I had once run the other direction from a bear – what not to do. I had almost stepped on rattlesnakes. I ran on a high desert trail where shotguns were permitted for dove hunting and stepped around shells. Kauffman wrestled the mountain lion, later estimated to be between 35 to 40 pounds, and suffocated it by stepping on its neck with his foot when it was on its back. 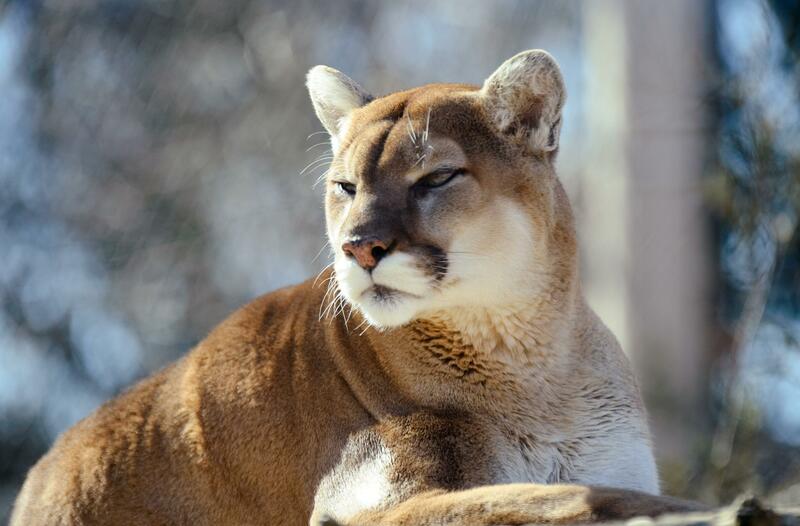 Kauffman required more than 20 stitches from claw and bite wounds on his face and wrist, which the mountain lion had seized in its jaws. “For people who trail run alone, if it’s really important to you and you’re willing to take the risk, the fact is that thousands of people do it every day and they come home and they’re fine,” Boulder, Colorado-based science writer David Baron said. “People ask me all the time, ‘This has all happened to you and you still run?’ ” said Nancy Hobbs, executive director of the American Trail Running Association, who has encountered a mountain lion on Barr Trail and been attacked by a hawk in Germany in more than 30 years of trail running. Published: April 14, 2019, 6 a.m.